It'll make you want to go on a tour, too! (SPOT.ph) If there's anything we learned from the November 4 episode of On the Wings of Love, it's that Clark has a way with words, and Manila is worth exploring (something we here at SPOT.ph already knew, btw). 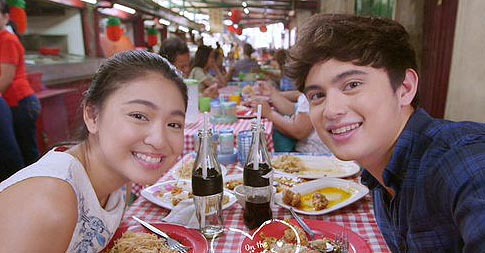 Leah (Nadine Lustre) takes it upon herself to make Clark (James Reid) fall in love with Manila again. Their first stop is an art market at Escolta, where they talk about staying true to one's Pinoy roots. Leah sums it up quite nicely: "Alam mo 'yong mga pangarap natin puwede tayong dalhin sa U.S., Canada, Europe...kahit saan puwede. Pero 'yong pusong Pilipino natin, maiiwan at maiiwan pa rin dito." They also visit the San Agustin Church, where Leah muses about the failure of her parents' marriage, despite taking their marital vows at the historical church's altar. This is where Clark, who seems to always know what to say, consoles her with a promise: "Kung ano mang sakit ang nararamdaaman mo ngayon, hinding-hindi ko ipaparanas sa iyo. Gusto ko mabuo ka ulit." The couple also pay a visit to Binondo's Estero Fast Food, where they have their fill of Chinese food. The place is special to both of them; Clark and Leah spent their childhood visiting Estero with their families. If that episode wasn't swoon-worthy enough for you, Director Antoinette Jadaone also gave a sneak preview of Clark and Leah all dressed up. Is that a wedding dress we see?! !